The Ginger Café menu at Kona Community Hospital is being upgraded to increase fresh ingredients grown in Hawai‘i, expand vegetable forward dishes, and improve flavor for scratch cooked meals. Kona Community Hospital’s Ginger Café staff. Courtesy photo. 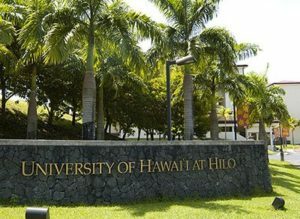 The initiative is named ‘Ai Pono, Ho‘omaka ana which translates to Eat Healthy, New Beginnings. The name, suggested by a nurse at the hospital, reflects the meaning of “made from scratch”. The program takes whole ingredients as they come from the farm to make healthy, nutrient dense meals. Kona Community Hospital selected Chef Greg Christian, founder of Beyond Green Sustainable Food Partners to lead the healthy food initiative. 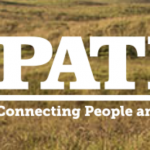 “We chose Beyond Green Partners for their ability to impact the whole community,” said Judy Donovan, marketing and strategic planning director. Construction workers, county employees, and others come to dine at the Ginger Café. 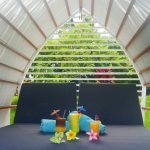 “‘Ai Pono. 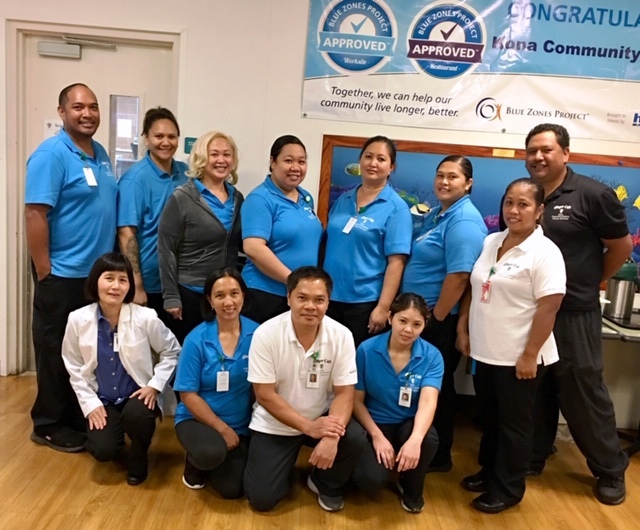 Ho`omaka ana—or Eat Healthy,New Beginnings—emerged from the hospital education committee as a Blue Zones Project to enhance our commitment to helping people to make healthy choices, as well as, our commitment to elevating the skills of our cafeteria staff.” Donovan adds. 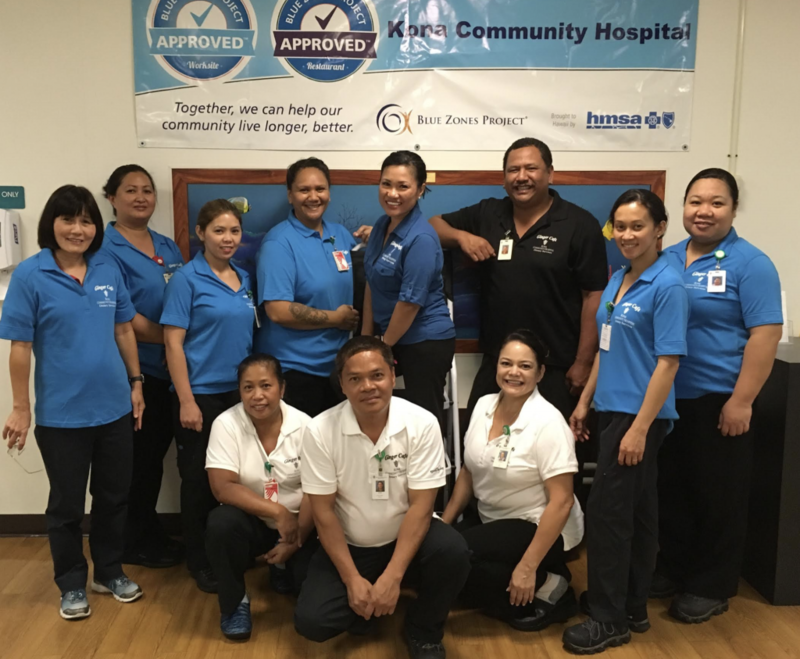 Kona Community Hospital was recognized as the first hospital to become Blue Zones Project ApprovedTM on Hawai‘i Island in April of this year. 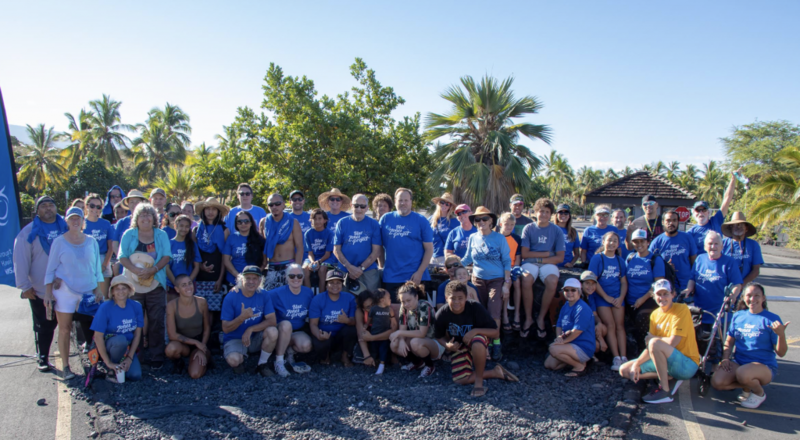 Brought to Hawai‘i through an innovative sponsorship by HMSA, Blue Zones Project is a community-led well-being improvement initiative designed to make healthy choices easier through permanent changes to lifestyle, environment, policy, and social networks. Ginger Café customers are surveyed daily to fine tune the menu offerings. Overall responses have been positive. Staff taste tested pizza last week and one customer wrote, “I thought it was DECLICIOUS! The crust reminded me of eating pizza at a pizzeria. The toppings and sauce had great flavor as well.” The café is piloting a salad bar and new menu items such as local ono with lemon and garlic, vegetarian pesto pasta, and eggplant adobo are offered daily.